Crushed Crystal malt for use in all grain and partial mash brewing . 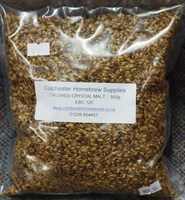 Crushed Crystal Malt is used in all grain and partial mash brewing. In full mash brewing, Crystal Malt is a common ingredient in many beer recipes and is often used in partial mash brewing to add body to the malt extract base. Lightly roasted, it will impart a "nutty" flavour to your beers. This size bag will provide sufficient Crystal malt for use in 2-3 brews depending upon your recipe requirements.